The Delaware River waterfront is going full-on boardwalk this summer, with everything but pizza-swiping seagulls. 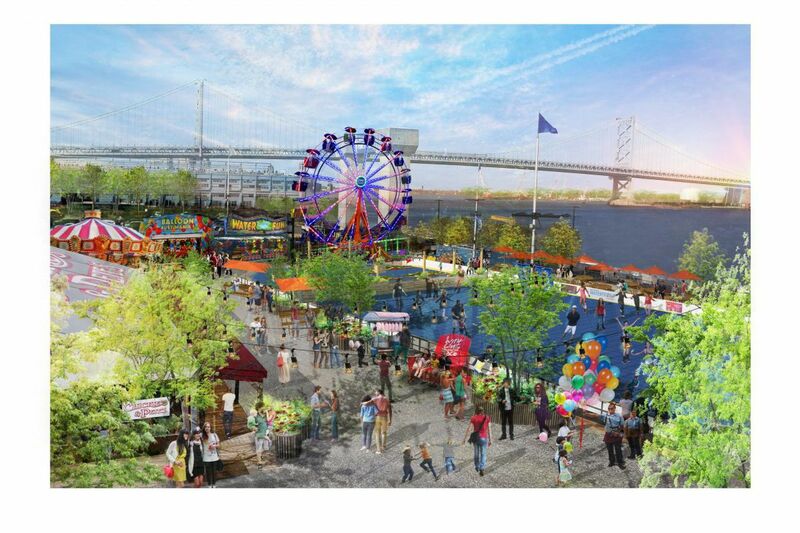 On June 18 — Father's Day night — Williamstown, N.J.'s Skelly's Amusements will install a 60-foot, 16-gondola Ferris wheel, a full-size carousel, and six boardwalk-inspired games at the Blue Cross RiverRink Summerfest attraction at Penn's Landing. The 10th Roots Picnic is coming. What keeps the band together? So just as Shoregoers driving across the Ninth and 34th Street Bridges into Ocean City get a view of Wonderland's giant Ferris wheel, commuters driving north and south along I-95 will enjoy that same vacation anticipation sensation. To keep things extra-interesting, the big marquee ride will have just a limited engagement before getting get swapped out for new ones. A few weeks after the initial installation, Skelly's crew will return to replace the Ferris wheel with Pharaoh's Fury (a swinging pirate's boat). Later, the Typhoon (a rainbow-style spinner) will replace the boat. It's possible the Ferris wheel will return at summer's end, but that's to be determined. The rides will require tickets. (Riders must be at least 48 inches tall to ride Pharaoh's Fury and Typhoon.) The new games — high striker, basketball, lucky ducks water race, break a plate, and more — will be cash-to-play. Owner-operator Michael Skelly said three games will have all winners with every play; the other three will have one. The Ferris wheel and the other big rides in the summer rotation weren't selected just for their boardwalky family-friendliness. They were also chosen for their visibility. "We wanted people to be able to see them from I-95," Skelly said. The carousel and the boardwalk games will remain constant through Labor Day, as will one-dollar-a-play fortune teller Zoltar, hanging out in the air-conditioned comfort of the 200-seat Chickie's & Pete's Crabshack, back for another Summerfest season (as are the outdoor roller rink, artist-inspired mini-golf, indoor arcade, and lodge). Also new to the Crabshack: all-you-can-eat snow crabs on Thursday evenings and sweet crabby corn — like kettle corn, with crab seasoning. The nonprofit Delaware River Waterfront Corp. is responsible for the full stretch of seasonal riverside attractions, including Festival Pier, the Great Plaza, and Spruce Street Harbor Park, along with Summerfest. "Our goal," said Jodie Milkman, corporation vice president "is to really fulfill our position as Philadelphia's urban beachfront. … Not everyone can go to the Shore, and not everyone can go to the Shore every weekend. Here's where you can go any night." In 2016, said Milkman, one million people came to have fun somewhere between Festival Pier and Spruce Street Harbor Park. This year, the agency thinks there's room for more. In the weeks between June 19 and Labor Day, Skelly's Amusements will employ a dozen workers at a time to run its Summerfest operations. The company also supplies rides and such to Abington's June Fete, the Middletown Grange Fair, and the Preston & Steve Campout for Hunger. Skelly and brother-in-law Tom O'Connor oversee the family business that Skelly's parents founded in 1956. Summer is their busy time of year, when they work "80, 90 hours a week," said Skelly. He said the lure of amusement park rides is timeless and unique. "You can't replace that type of entertainment — boardwalk entertainment — with a video game or anything along those lines," he said. "You can't ride a Ferris wheel in virtual reality and have the same feeling." Blue Cross RiverRink Summerfest is open 1-11 p.m. Monday-Friday, 11 a.m.-1 a.m. Saturday, and 11 a.m.-11 p.m. Sunday through Labor Day. New attractions open June 23, 101 S. Columbus Blvd., 215-629-3200, delawareriverwaterfront.com.